Believe it or not it's now been a generation since the memorable Yellow Pages advert featuring JR Hartley - the old man looking for the book "Fly Fishing". It was first aired in 1983, crikey how time flies! However, excitingly, the people at YELL (that's the new name for the Yellow Pages company) have just remade this iconic advert, and made it up to date for our technology inspired age. Have you seen it yet? The original version - released in 1983 - had an elderly actor called Norman Lumsden trawling slowly though bookshops looking for a copy of "Fly Fishing by JR Hartley". 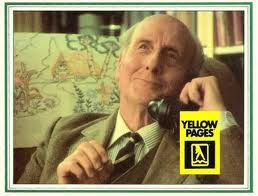 Finally, on the advice of his daughter, he consults the yellow pages and finds it. Then we find out that after all this that HE is the JR Hartley who wrote the book! Very heartwarming. The new advert features a DJ "Day V Lately" trawling through record shops, looking for a copy of "Pulse and Thunder".... "By Day V Lately". Shot for shot it's almost identical to the original advert, the similar way the shopkeepers keep denying him, even down to how it's Lately's daughter who eventually helps him find the record by recommending he uses a Yell smart phone app (rather than the antiquated yellow pages book!). The original advert was one of the most famous adverts ever - A viewers' poll by Channel 4 to find the 100 greatest commercials of all time ranked the ad 13th - just behind adverts like the Ferrero Roche one, the SMASH robot and the famous Hamlet Cigars commecial (the man with the comb over haircut). The original JR Hartley advert was so well known it made it into common usage, it was parodied by comedians like Harry Enfield, and Fry and Laurie sketch, and even inspired two imitation books by Michael Russell using J R Hartley as a pseudonym. Sadly, the actor from the original advert - Norman Lumsden - died in 2001 at the age of 95, but he was very fondly remembered. So keep an eye out for the new one, see whether you find it as iconic, and why not look up the old one on you tube - it's there, and it's got 31,00 hits! The mobile phone is perhaps the most futuristic thing about our lives, but more and more the most profitable things about them are nostalgia based tie-ins! Fact! Over the last few years companies like "Player X" have been busy making mobile versions of some of our favourite shows from the 1970's, 1980's and 1990's! Shows like "Bullseye", "Sale of the Century" and "Strike It Lucky" have been huge hits! Understandable really. I love the idea of my messages arriving with Bully saying "Aaaaaaannnnd One" if it's my first text, or "Aaaaaannnnd Two" for my second etc. Nice. 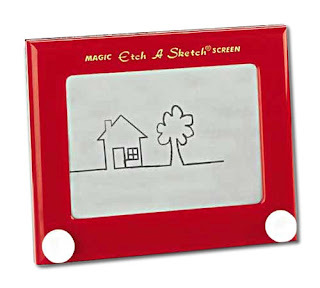 Recently these mobile-scheming people have even managed to make a mobile version of "Etch-a-Sketch"! The classic, and ubiquitous drawing game we surely all remember from our childhood. It has a free-drawing mode which looks so much like the old toy, it's spooky. It really transforms your phone. You can save your drawings and email them to friends, or use the application to make any photo in your gallery look like an Etch-a-Sketch drawing! Some new models even allow you shake your phone and clear the screen! Just like the real Etch-a-Sketch! Amazing! I would most definitely need that function - when I was young I spent more time shaking and clearing my screen than drawing. I would always be trying to make the perfect spiral and then would get nudged at the last second and it would all be ruined! But I've never been much of an artist anyway. It has a game component as well, which is similar to Etch-a-Sketch but is more like that other 1980's staple computer game - Qix.